Plantain is one the most flexible food ever. It can be cooked, fried, roasted or even eaten raw. Plantain can also be eaten as a side food with practically any other dish. That’s why you should expect plantain to have amazing health benefits. 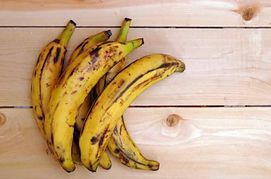 • Plantain are similar to bananas, but have major differences. Do you know that plantain is eaten as a vegetable? While banana is eaten as a fruit. • Plantain is the major food of the Dominican republic. • They are over 200 species of plantains. • Green plantains tastes a lot like potatoes. > Plantains contain 97% carbohydrate, 2% protein and 1% fat. > It contains much more vitamin A and C and very little of Vitamin B and E.
> It has a lot of potassium and magnesium. And very few sodium and calcium. > Plantain has an estimated 230 calories (970kJ). Most of which comes from carbohydrates. > Plantain also has a huge amount of fiber. > It is very low in saturated fat, approximately 0.1g. Based on all these facts above, let’s look at the health benefits of eating plantain. 1. Plantain is an excellent source of vitamin A. What does that mean for you? Vitamin A is essentially responsible for numerous bodily functions. It helps in reproduction and is important for a healthy eyesight. Apart from that it is also a powerful antioxidant, which makes it a great food for healthy eating. 2. They also have a large reserve of potassium. Potassium is a very important mineral that enables your muscles to function properly. They also play a role in maintaining normal heart rate and in digestive health. 3. They also contain a huge amount of dietary fiber. Fiber is a valuable nutrient because it helps alleviate the prospect of having diabetes and certain cancers associated with the gastrointestinal tract. Eating plantain means you can also avoid constipation and prevent heart diseases. 4. Plantain is also rich in another vitamin vitamin C!. Consuming foods that have plenty of vitamin C , aids your body fight infections. Including plantain in your diet propels the vitamin C to assist your body in absorbing the iron you consume from your food, which ultimately leads to an increased production of red blood cells and improved oxygen circulation. Vitamin is also a popular antioxidant that destroys oxygen free radicals. 5. The excellent amount of magnesium present also means that your bone is strengthened adequately and your cardiovascular system is guaranteed to function better. 6. For women menstruating, plantain is a great food, as it relieves the discomfort and pain experienced during such times. Make it a priority to including plantain to your weekly diet and to your healthy recipes. Remember it is a very flexible food, and can go hand in hand with and other dish. Above all it has amazing health benefits. Thanks for reading. Please leave your comments.